The demand for SUVs have seen a steep rise in demand in the recent past in the country especially with the launch of new Fortuner and exclusive entry from the American automaker, Everest. The segment has gone crazy in terms of competition offering customers with a wide range of choices to choose from. The competitive spirit has recorded a new high while models contributing to company’s overall sales show that this rise won’t settle in anytime soon. 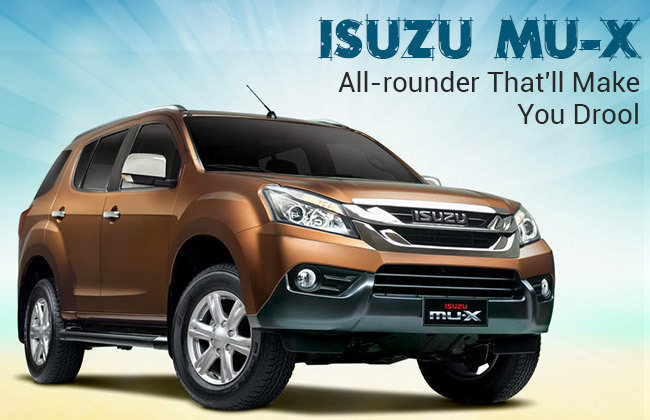 One such model, which has further spiced up things is Isuzu MU-X. The single warrior from Isuzu’s den has it all covered to compete against the likes of established players of the segment. High on style, the new MU-X is alluring, elegant and tough at the same time. With a bulk structure, bold and authoritative appeal, it has the character to flaunt. Sharing majority of styling cues with Chevy Trailblazer, the MU-X still has the character of its own. With optimum chrome treatment at both front as well as rear, the MU-X is a fighting competitor ahead of Fortuners and Everests. Head creases, aggressive front profile and pleasant rear design are major highlights that keep it apart from the league. Being an SUV lover you can’t deny the fact that it has all ends covered and that too in style. Step inside and all your senses would immerse in soothness and comfort. It’s classy, sporty and durable at the same time. You would feel a sense of comfort from the word go. The dash, panels, plastic and upholstery are certainly outstanding to witness. Each calls out for quality and class that the Japanese company has integrated making it stand against the big giants of the market. 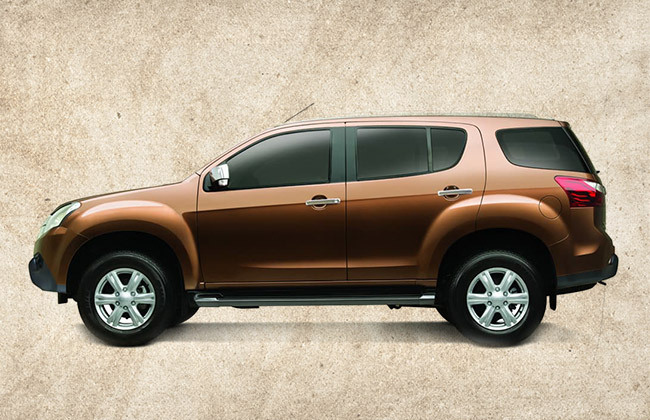 Apart from comfort, the cabin comes loaded with a wide range of features, which as an SUV owner are desirable. 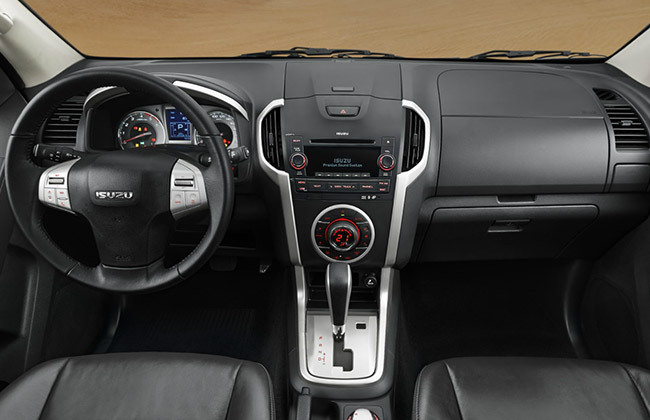 Naming some would include an eight inch infotainment system with touchscreen with multiple connectivity options like CD/VCD/DVD/Aux-in/Tuner/MP3/USB, Bluetooth and iPod. Navigation system, 10-inch roof mounted video screen and leather wrapped three spoke multi-function steering wheel are more make it superior from others. 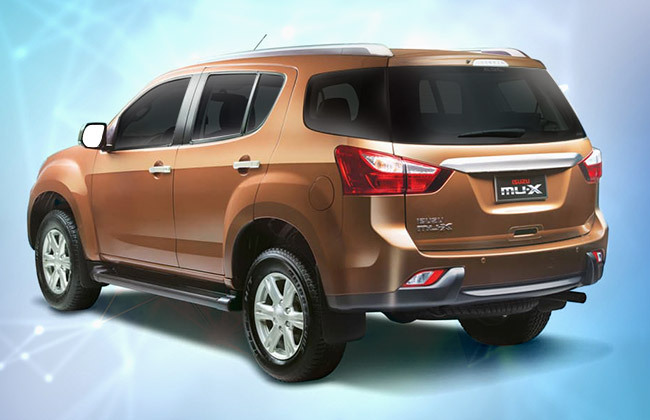 Available in both four-wheel and two-wheel drive modes, the new MU-X is up for grab with two engine options, i.e. 2.5-litre and 3.0-litre. Out of which, former is capable of pumping out a max power of 136 PS while the latter, bigger and powerful engine is good enough for 163 PS. The engine fitted under the hood of this SUV is although not that powerful than others in the market but is reliable, responsive and calm enough to grant an exceptional driving experience to its owner. Take it over high-speed roads or push it through the corners, it pleases you every single time. Have you ever wondered if an SUV lagged on practicality front? Probably, we can’t and MU-X isn’t an exception. 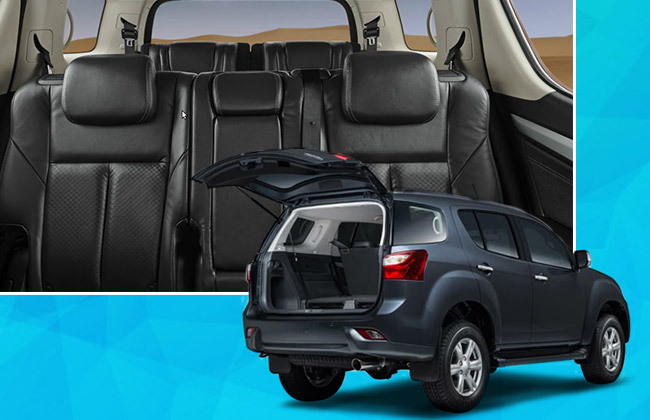 It comes with practical spaces inside that are proficient to make your drive hassle-free. Cargo is generous too, which serves perfect if you are a wanderlust. The cargo can further be extended to create more space for your luggage and other necessary stuff. Tumbling can be possible till second row which makes it a brilliant option to grab. Fitted with potent suspension system, double wishbone and five-link coil spring that ensures ride quality is up to the mark every time you sit behind the wheel of MU-X. Bumps and rough terrains are soaked in quite easily by the big machine while countryside drive becomes easy and worrisome that you won’t feel any kind of stress or tiredness after your adventurous run. Features like Hill Start Assist, Traction Control System, Anti-lock Braking System and Electronic Stability Control make the ride even more relaxed.